She finished an architecture course but she is better known for her agricultural pursuits. We are talking of Rolita “Baby” V. Spowart, an old time friend who is currently into orchids and ornamental plants, Milky mushroom, and commercial rice farming. Last November 2, she called us up from her rice farm in Cabatuan, Isabela. She was particularly excited, telling us about her ratoon rice crop on about 40 hectares. She said that the crop will be harvestable in two weeks after our conversation. And representatives of the Department of Agriculture who visited her farm estimated that each hectare could yield 80 to 100 cavans per hectare. That yield of 80 to 100 cavans per hectare is considered very high as far as ratoon rice crops are concerned. Rice ratoons may normally yield about 40 cavans of palay per hectare. It could even be less. By the way, a ratoon crop is the crop that follows the first harvest. After harvesting the crop, tillers arise from the stumps of the harvested rice. These tillers will grow and produce panicles that are harvested about 90 days after flattening the rice stubble to the ground after harvesting the first crop. Her rice farm is non-irrigated but the ratoons have grown very well by just depending on the rain. Her initial crop was planted in May of this year. She harvested the same last August and immediately flattened the rice stubble to the ground so that the tillers that arose could grow freely. Although the farm is rainfed, the plants survived even without any irrigation. Baby said the roots of the rice plants had gone deep in the ground. She said she just applied a minimal amount of urea plus EM or effective microorganisms. If she had applied more fertilizers, she believes her ratoon crop would have yielded even more. The ratoon crop is really profitable because there are fewer expenses involved. There is no need to plow the field. No new seeds are required. And the crop is harvestable within a shorter time. We first knew Baby Spowart many years ago as an architect who self-studied tissue culture of orchids. She did research on the Internet and put up her laboratory with materials she bought from Thailand. She produced a lot of orchid seedlings of the varieties from Hawaii and sold many of the same to customers from the United States and South America. Up to now she maintains an orchid farm for cut flowers and a nursery in Bulacan. 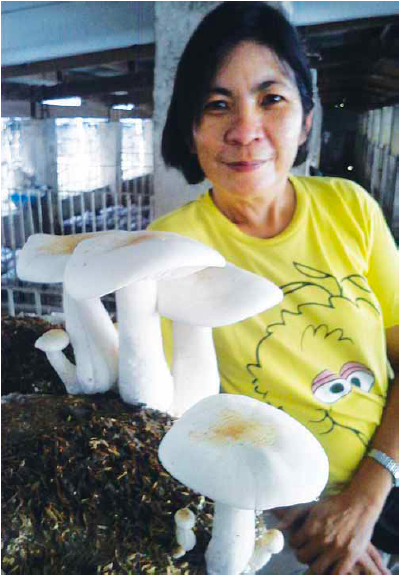 With the help of son Mark, she has a Milky mushroom project and ornamental plants in Amadeo, Cavite. aby is responsible for bringing into the Philippines the Milky mushroom from India. Baby is responsible for bringing into the Philippines the Milky mushroom from India. This is a giant, very white mushroom that is easier to propagate than the commonly grown oyster mushroom. 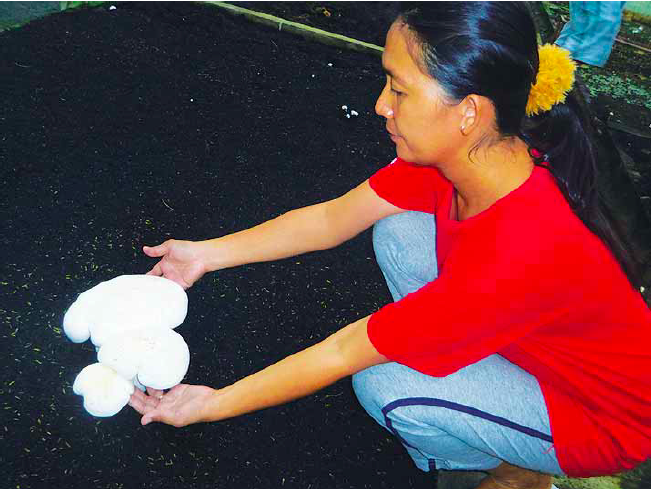 Now, an entrepreneur who studied under Baby has put up a commercial Milky mushroom production project in Pura, Tarlac to meet the requirements of two big regular buyers. And the entrepreneur is also conducting seminars to teach other interested growers. Baby is also expanding her own Milky mushroom production in her farm in San Jose del Monte City because of the interest of foreign buyers. She said that a Japanese importer is very interested in importing the mushroom at a very high price but with a special packaging. Another interested buyer is from Hawaii. The fellow wants to import not the mushroom but the spawns for growing in Hawaii. What keeps Baby very occupied in Isabela is the rice farm that was left to her by her late father, an agriculture graduate of UP Los Baños. In her rice farm, she has been experimenting on a lot of things. She raised 3,000 ducks in the farm at one time. After stopping for some time, she is again ready to buy a new batch of ducks after being convinced about the viability of the project. Then she experimented on ratooning her rice. While she has not made a name in architecture, Baby has already done so much in the field of agriculture. By the way, she has mechanized her rice farming operations. She has her own rice harvester that can harvest three hectares in one day. But she also relies on the services of people who harvest her crop with their own mechanical harvesters. She relates that there are now thousands of Kubota rice harvesting machines in Isabela and many of them are for contract harvesting. Baby does not have any problem harvesting her rice crop because of the private harvesters. She said that the harvesters get a 9 percent share of the harvest. But it is so convenient for her because the palay is delivered to her bodega, already placed in sacks. The sacks are provided by the harvesters. This appeared as “Baby Spowart: The Lady Architect Who Turned to Farming” in Agriculture Magazine’s December 2014 issue.